Billy Kleiber sent the following picture of Suburban 429.
hank , how can i get a copy of that book.? Do you remember Suburban Days ? The book can be purchased at the Bessemer Area Chamber of Commerce, Plaza Cafe in McCalla and Hank's office at 1808 10th Ave N. Bessemer. I picked mine up today and was amazed at the quality of the layout and the amount of information. The stories and pictures in the book brought back a flood of memories. Anyone who worked at Hank's, A&A or Suburban is going to love this book! Wow....hate it took me so long to find this section of the site! Looking at it brings back some good memories! It is so great to hear about all the memories that everyone has been sharing. I have awesome memories as well. 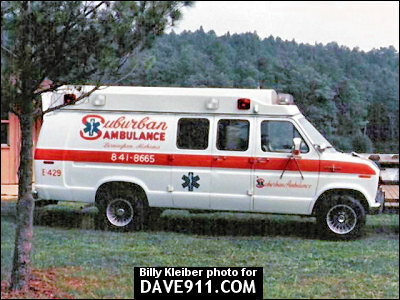 Growing up with all the people that worked with Suburban Ambulance. I just recently talked with Eugene aka Rhino, he had mentioned that there was going to be a Reunion of all the past employees, I want to say it was going to be in July, but not sure. If anyone knows the details, please let me know. Almost forgot, this is Johnny Reno, Dennis Reno is my Old Man. Would enjoy hearing from all the past employees, contact me at renoj69@msn.com. Great to hear from everyone and to read all the great stories.